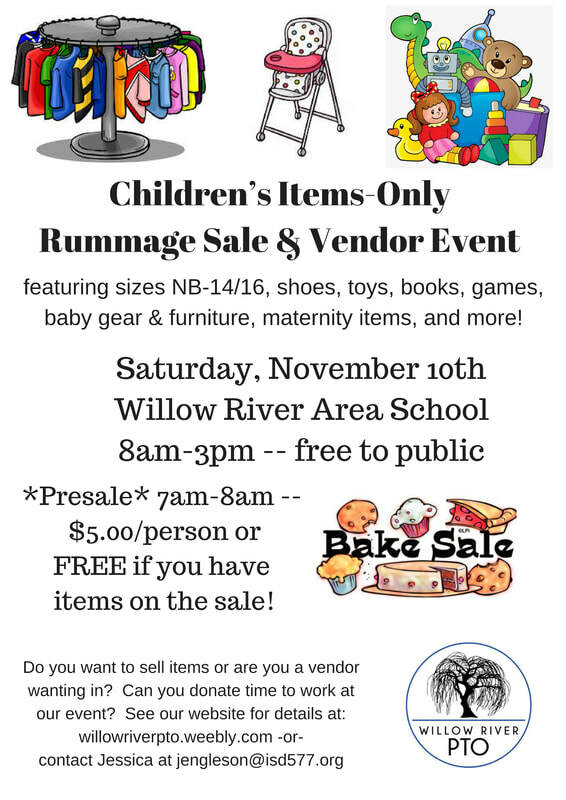 RUMMAGE SALE - WILLOW RIVER AREA SCHOOL PARENT TEACHER ORGANIZATION "PTO"
Please be advised that we do not have the capability to accept credit/debit cards. Came here to see how you can help us? -Items must be clean, smoke-free, and in good shape. -Sizes preemie/newborn - child 14/16. -Shoe sizes vary, but please be child shoes. -All items need to be child-related. -Toys, books, baby gear, & even big items okay! - MATERNITY clothing also welcome! 3. Drop items off **sale date** between 4pm & 7pm -- We will help you set them out in the correct areas and make them look nice. Now the best part-- we sell the items for you on Saturday!! *disclaimer: PTO is not responsible for lost or stolen items. We also have the right to refuse any items that we don't feel are appropriate for the sale. Thank you for understanding! Unless you are a duo who sell your product together, we only allow one of each vendor company to join our event. Slots are filled first-come, first-served with advance notice to PTO member vendors. We ask that you donate a $10 value door prize to be given away during the event.